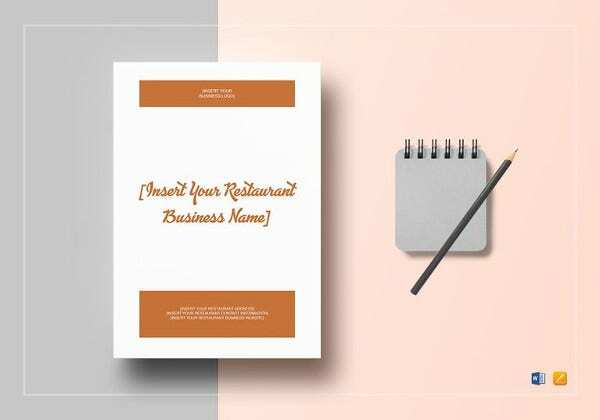 If you have a food joint or a full-fledged restaurant then you can resort to such survey templates to get and gain an insight into the customer base and also acquire some knowledge on how to make changes if it is to add to the betterment of the business. Food survey can also be done by nutritionists who want to know how the diet and the nourishment are of a particular place and take measures likewise. You can also see Patient Satisfaction Survey Templates. This sort of template is used to make forms for upcoming restaurants or catering services so as to know how the food is as per the taste, whether the dishes are too rich or not and where they can actually provide with such kinds of edibles. The answers can be made with Yes or No. 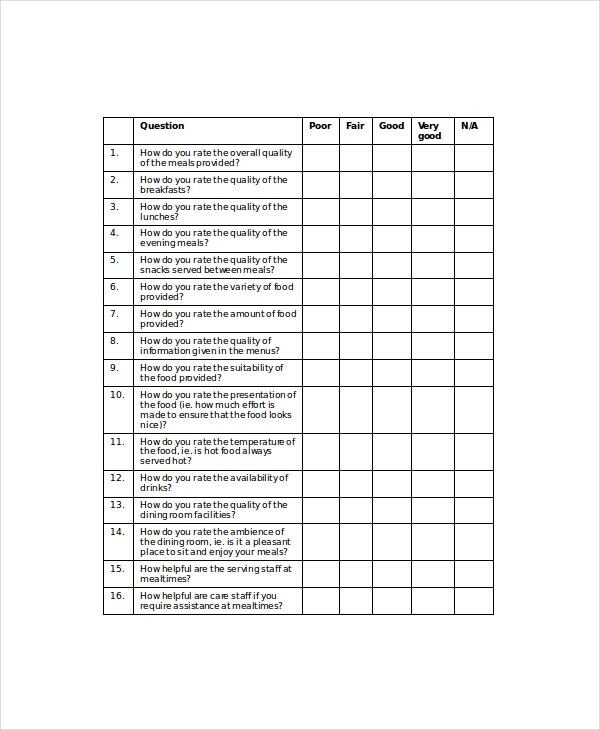 This particular template is to be used as the food survey form that is used by the dieticians and the nutritionists to conduct a survey in the areas predominant with malnourished people. Their nutrient intake is noted down so that subsequent measures or actions can be taken later on. 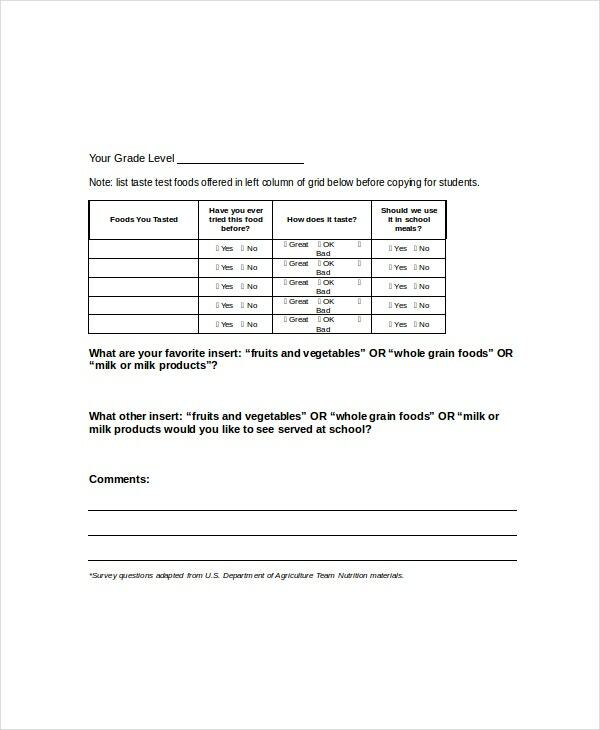 This particular food feedback forms can be used by college or office canteens where they serve food to the students and the employees. The form needs to be filled up by the customers and later on, the concerned people can make an assessment out of it and thereby help in the improvement of the quality of food if required to do so. This particular template comprises of the reports of the food based surveys made in a particular area. The document is filled with details of how the food industry of a particular place is, what the food based trends are, the food supplying chain, the purchasing process and the availability of the grocery stores in the particular area. This particular template can be used to make survey so as to know about the food services of a particular facility. Their main aim is to maintain the quality of the food and also the nutritional benefits of the people who consume the food. The answers are anonymous and if somebody chooses not to answer a particular question they can skip it at ease. > Where can you use a Food Survey Template? Food chains, food joints, stand-alone restaurants, five-star deluxe hotels and many other places of such type make a use of such survey forms. If you happen to be a nutritionist or a dietician then you can put this form to use. 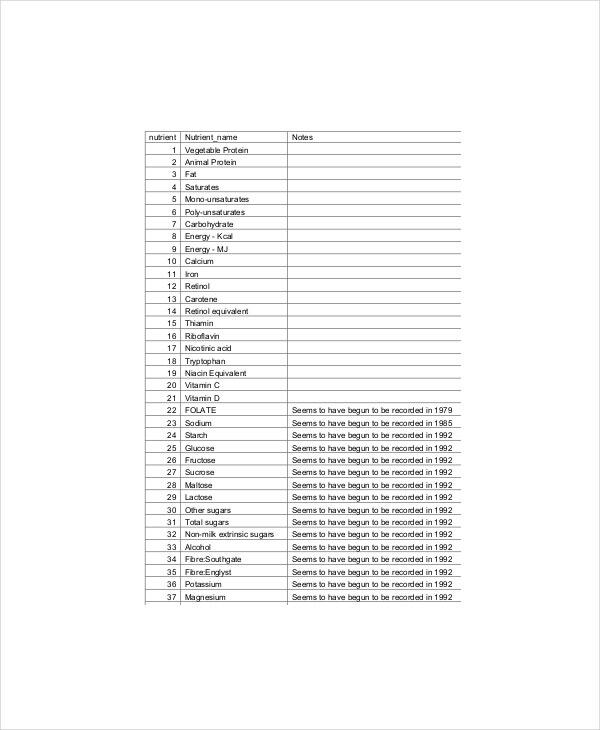 This form is used to note down all the food service related queries by the concerned body, the quality of the type of food that they are serving if any changes need to be made or anything they want the concerned people to add to their joints. Customer satisfaction can also be obtained with the use of such forms. You can also see Birthday Calendar Templates. > Who all can Fill up a Food Survey Template? 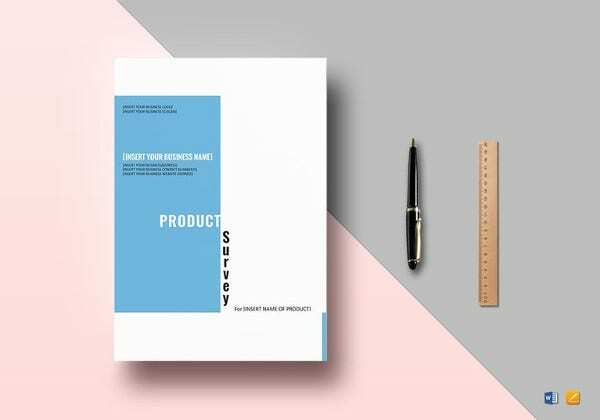 Customers or common audience who are approached with the particular survey form can fill it up and give sufficient feedback to the concerned people. In the case of restaurants and joints, a form of such kind is provided at the end of the meal and right before the bill is paid. You can also see Training Calendar Templates. Anybody who has availed food service can fill up the form. In the case of nutritional survey or canteen quality based survey, a large number of people are targeted. On the basis of their feedback, the resultant decisions are made by the concerned staff. So customers, fill them up honestly and carefully. 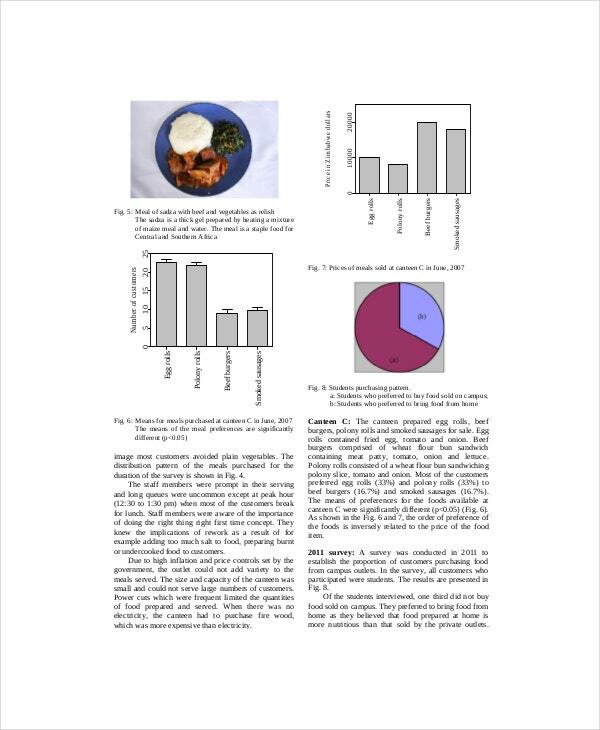 > What can one achieve by Using a Food Survey Template? Honest feedbacks on the food survey template can help a company to grow. Customer satisfaction can also be known with the help of these forms. 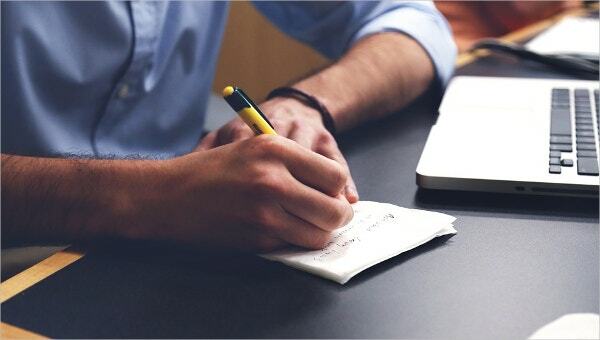 If a customer makes any request regarding a particular food item, the chef or the restaurant staff can make a note of it and produce it if they can make it happen. A happy customer is responsible for the full-fledged running of a particular restaurant, so their opinion is what the future-oriented services are based on. You can also see HTML Calendar Templates. 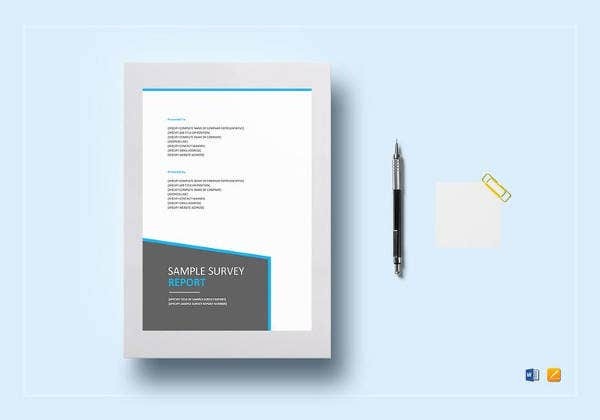 Such kinds of food survey or restaurant survey templates are important as they help one to measure the customer satisfaction and thereby help in the growth of the joint. Not only service-based survey but also product survey can also be conducted with the help of such forms. In order to get better thoughts and opinions, start using the form if you happen to own a food-based company.